The then leader of the Nationalist Party, Eddie McAteer, leading the October 5, 1968, civil rights march up Duke Street. When you don’t hear the words yourself, there is doubt that they are being reported accurately. If, as a friend witnessed, the guide informed tourists overlooking, from their vantage point on Derry’s Walls, what is now referred to as The Bogside, “Catholics did not have any jobs or votes,” it is not a picture which residents of the city at the time will share. In 1968, prior to a population shift, Londonderry was a city where many families from across the community lived in shared neighbourhoods. This was true of public and private housing. One identity viewed as either Catholic or Protestant, or as either Unionist or Nationalist, might predominate in a particular area but neighbourhoods were often mixed hence the close proximity of churches and schools which served the requirements and preferences of different denominations. Derry City FC was a mixed team with wide support. Unemployment was high and imbalanced in terms of males and religion, but due to the demography of the period it would have been impossible for all of the jobs to have been filled by non-Catholics. Newly arrived employers like DuPont, BOC and LEC, which were based on the new industrial estates, had mixed workforces. The same was true of transport services, shirt factories and bigger retailers. Some privately owned firms favoured employees with whom they shared religious and political convictions in common, but this was not the preserve of any one section of a community which, over the years had witnessed spasmodic sectarian violence between sections of the populace around parades, festivals and tension-filled elections that pre-dated the establishment of Northern Ireland. In respect of voting, Unionists and Nationalists who were legally entitled to vote in Westminster Elections were able to do so. Some nationalists opted not to vote. Unionists as well as Nationalists had no vote in local elections if they were not property owners. Many of these tenants were on a lengthy housing list and while awaiting the allocation of a home, often lived in poor quality rental accommodation or in properties which were damp-free but lacked indoor toilets and had no bathrooms. Hence, the recollections of a past resident of Albert Place in the mainly Protestant Fountain area who recalls that when she was socialising at the weekend she had to go to her grandparents for a bath due to her not having a bathroom in her home. It is not unlikely that in the cinemas or dance halls she would have mixed with young people of varied backgrounds from all parts of the city who shared this experience. Residents in Major’s Row in the Wapping Lane area, also in the Fountain Street area on the cityside, kept comfortable homes but often had a bedroom in a loft area accessed by stairs more akin to a ladder and had outside toilets at the end of a long garden or yard. Many had jobs, but not in highly paid or secure employment as the decline in the shirt industry was to demonstrate. It was individuals such as these who were to find their homes come under attack as the unrest which flowed from Civil Rights parades and street disturbances assumed an ugly sectarian character, shaped by a variety of factors. It was this which began to distort in the eyes of sympathetic observers the proclaimed platform of Civil Rights and its commitment to non-violence. Denial of the franchise, limited home ownership and home comfort and lengthy waits on a housing list were not the preserve of one denomination, political or cultural identity, albeit that individuals viewed as coming from the Catholic and nationalist/republican background, were most and disproportionately affected. Regardless of background, a majority of the city united to protest at the lack of investment in infrastructure, at the closure of railways, the decisions to build Craigavon and locate the second university away from Derry where Magee University College would act as a nucleus for further development. Within the wider Unionist constituency this, added to frustration over housing, social issues and political unionism’s expectation of blind loyalty and acceptance of an electoral system which was an embarrassment to the more progressive minded and favoured the influential self-interest of some representatives, found expression in a number of ways. Unionist voters disenchanted by the decision-making of some Unionist representatives perceived as self-serving, were prepared to split the vote and opt for candidates who challenged the Unionist status quo and supported the call for reforms advocated by the emerging Civil Rights Movement. They were not solely middle class for Unionists deprived of voting rights, adequate housing and fair employment opportunities realised that improvement in the franchise, housing and job prospects would bring gains for all sections within the broad identity groupings. Reforms showed this to be the case. Yet, as festivals, marches and the media focus on the 50-years commemoration of the Civil Rights march in Derry on October 5, 1968, few unionists feel included or inclined to afford the enthusiastic endorsement of the nationalist and republican community. The simplistic view is that this is due to the belief that the Civil Rights Movement was a cover for the IRA. 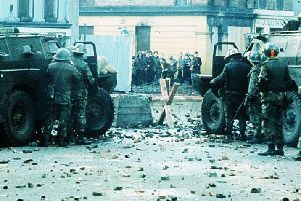 Some Unionist leaders promoted this view at the time and the actions and verbal onslaughts of those engaged in street violence reinforced the assertion. But, this fails to do justice to the differentiated experiences, perspectives and perceptions within unionism in Derry, no more homogeneous in 1968 than now, as politics in N. Ireland continue to address issues of social justice intermingled with constitutional status, the legacy of the recent as well as longer past and that soft and ingrained sectarianism which many like to disown yet finds expression in the grown comfort of gatherings where groups and individuals feel they share the communal pedigree of the like-minded. Mainly however, it is due to the fact that what characterised and flowed from the Civil Rights campaign and the reactions of ruling Unionism and broad political nationalism turned a legitimate struggle for justice and social togetherness into a competitive struggle for Catholic and nationalist empowerment which demonised the unionist population and, in its consequences, consolidated militant republicanism and loyalism. For its part, tone-deaf political unionism pressured by militant Protestant unionism, the demands of those who were coming under sectarian attack and wedded, without consideration for the minority, to sustaining a supremacy which stood in the way of democracy, contributed to the events which unfolded. Institutions, through which you can sort things out and deliver the outcomes which you should be seeking, had not been created. No safety valve was available for non-unionists. Sectarian and bigoted fundamentalism became the puppet that now pulled its own strings and deepened the wedge between group identities, even where shared human social values had existed. Had this not been the case and the Civil Rights organisations acted to sustain peaceful protest and a more socially ambitious and enlightened platform this might have been avoided. Even in the 1960s when social mores and norms were being challenged, there was no mention of LBGT, Disability, Language or Women’s Rights. Were there those within the many thousands filling the streets who were aware of the abuses in homes and other institutions now in the public domain yet remained silent in an act that was the antithesis of civil rights and a block to true equality and equality? Doctrinaire activists now suddenly empowered but ideologically shackled to revolutionary republicanism and the anti-colonial rhetoric of Fanon and others embraced instability but then retreated to their communal roots. Against this, tentative alliances for reform may have been more robustly forged but they failed to survive and an opportunity was missed. Now, the organisers of the 50th commemoration of the Civil Rights Movement have endeavoured to make events inclusive but it is questionable if this has been achieved. There are difficulties in the way. In failing to differentiate between political unionism and the diverse strands of community and civic unionism which existed, an increasingly fractured Civil Rights Movement not only moved to delegitimise the unionist state but the consent of those who supported the maintenance of a reformed Northern Ireland. Perhaps unionists turned their backs too soon on the Civil Rights agenda and this was also a contributing factor as a lethal cocktail of shifting political agendas developed. There is no doubt that it may have been an unintentional consequence but a target was created for intimidation, physical attack and eventual exile within the city. An obstinate insistence on segregation prevailed. This, allied to the flow and counter flow of paramilitary and state violence resulting in lost lives and injuries across the whole community robbed civil rights of much of its civility as that most basic right to live and prosper in peace was sacrificed and used as political leverage. The legacy of this, the present-day nature of the Civil Rights commemoration which is heavily nationalist in nature and the politically opportunistic response of some unionists goes beyond different narratives and indicates a continuing need to bridge the fault lines and deficits in reconciliation which remain. Truly inclusive and shared reflection will ultimately prove more beneficial than affording ideological definitions opportunity to feed general polarisation.